Above: One of the photos of cold classrooms Baltimore teachers were posting on social media after their return to school in January. 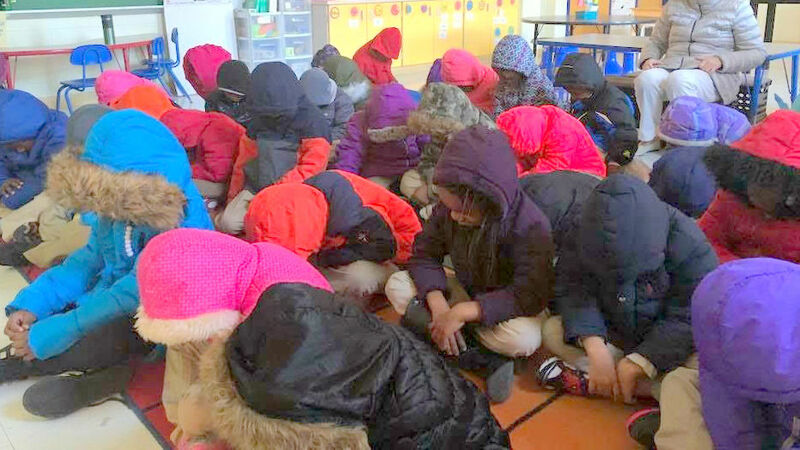 But at schools across the city, students and teachers were surprised to find flooded classrooms and indoor temperatures that were barely above freezing. “It was miserable. The kids had their coats, hats and gloves on all day,” said Jesse Schneiderman, a social, studies teacher at Frederick Douglass High School. 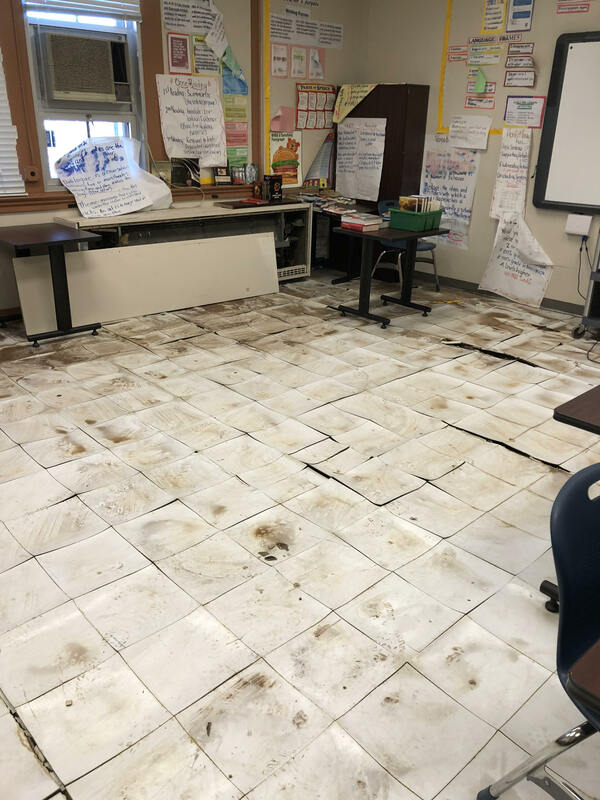 Flooding from a burst pipe had rendered one classroom at Frederick Douglass unusable, Schneiderman said, providing photos showing warped floor tiles and drenched papers. “We were shocked we weren’t one of the schools sent home,” Schneiderman said, noting that water also damaged the wrestling room, the weight room and the room where JROTC supplies and uniforms are stored. City Schools only closed four schools today, but social media indicates the cold conditions could be found across the city. The Internet was flooded with outraged postings by teachers and students showing kids huddled in coats and low readings on thermometers from many more schools, including Patterson High School, City College and Calverton Elementary School. San Filippo said he couldn’t understand why school officials opened so many unheated schools and were so reassuring on social media. Reached at City Schools headquarters in North Avenue, spokeswoman Edie House-Foster said school officials are doing their best with aging facilities. “Our facilities teams have been working feverishly to address the problems,” she said. Woodlhome Elementary/Middle School, the Elementary/Middle Alternative Program and Frederick Elementary either closed or dismissed early, she said. Lakeland Elementary/Middle released students at 12:45 p.m. because of heating system issues. 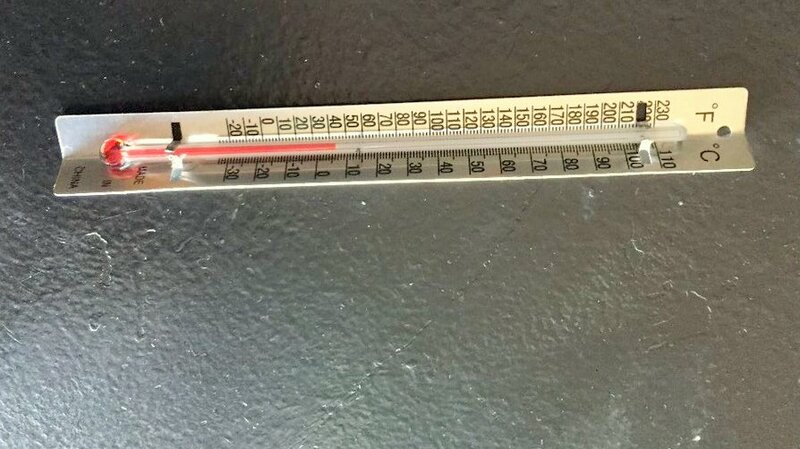 This was the temperature in Jeffrey San Filippo’s classroom today at Calverton Elementary/Middle School. Cohen said he heard today from parents and teachers across his Southeast Baltimore district, concerned about freezing classroom. Many students simply left or called their parents to pick them up. Those who remained coped as best they could. At Calverton, San Filippo said, two classes with a combined roster of about 200 were moved out of too-cold second-floor classrooms into the warmer cafeteria downstairs. “By the end of the day thee were only about 27 or 28 kids left,” he said. At Patterson High School, teacher Jim Ritter used a space heater to get the temperature up from 37 degrees to just 46 degrees by 12:30 p.m.
“We had students tell us all day they just weren’t able to concentrate,” he said. With too hot or too cold classrooms a recurring problem at Patterson, teachers there formed a committee to advocate for their building with the central office. But Ritter said no teacher should have to do that. Schneiderman said he was incensed by a system that would force children to attend schools in such poor condition. “Over the winter break, facilities staff monitored schools to check on heating systems, plumbing, and electricity. Numerous problems were identified and resolved. Unfortunately, with the extreme temperatures, new problems can emerge quickly. Our priority is always to open buildings whenever possible. We want students to have every possible opportunity for teaching and learning, and we also want to make sure that students can get the services and supports that many families rely on – for example, warm meals and before – and after-school care. We have many schools with leaky windows and outdated heating systems that have a hard time keeping up. With extreme temperatures, we have the added challenge of freezing pipes and water main breaks. Our facilities staff are on call around the clock to address these problems and make buildings as comfortable as they can be. In some cases, we rely on principals to relocate or combine classes when specific areas of a building have heat or water problems.